Visit the site of the Whitepod ski resort in the Swiss Alps between April and November and what you’ll see of it is . . . nothing. You’ll see no roads. No electrical wires. No place to stay. Just a 19th century farmhouse. And a pristine alpine meadow that’s begging for some von Trapp kids to twirl around in Sound Of Music style. And an amazing view. The vista of the snow peaks from this virtually untouched place 1,700 meters (5,600 feet) above the oceans is among the grandest in Europe. “Untouched” being the key word. Amazing hot tubs. But going to the restroom is an undeniably chilly affair. Spot Cool Stuff is occasionally asked what our favorite hotel chain is. The answer depends. We are fans of the W Hotels, appreciate the inexpensive airport stylings of Yotel and are keen on virtually all the Kimpton properties. But our choice for favorite hotel chain might have to be the igloos of Iglu-Dorf. Why do we like the igloo rooms of Iglu-Dorf? Because they are igloo rooms. Made from real snow and ice. Ski bums, do not despair when the weather warms at your travel destination. Though the snow may vanish, your opportunity to partake in downhill skiing and boarding needn’t. Skiing holidays traditionally take place in prestigious Alpine ski resorts like Verbier and Chamonix. France, Austria and Switzerland are the undisputed ski capitals of Europe, with American and Canadian ski resorts having established excellent reputations on the other side of the pond. But the glamour is fading. To borrow from the French, Alpine ski holidays are just so…well, passé. For those after something a little more interesting, a little more off-the-beaten-track and a little more unusual, here are three ski holiday destinations you’ve probably never thought of. 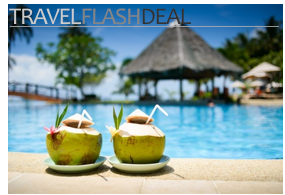 With a new year comes a new selection of travel deals. And a difficult choice: take to the snow of the mountains or escape to the warm waters of a tropical beach? Fortunately, we’ve found discount deals for both options. To stay updated on our travel bargain finds you can . . .
or—why not?—act on all three of those options. Please note that all of the offers below are for a limited time. Happy high-value travel!